I have been told on more than one occasion that I hadn’t really had the ‘true’ RV experience unless I had gone to Salvation Mountain and Slab city in Niland, CA. So being out west and not wanting to miss anything, I made it a point to take a day trip to Niland this year. 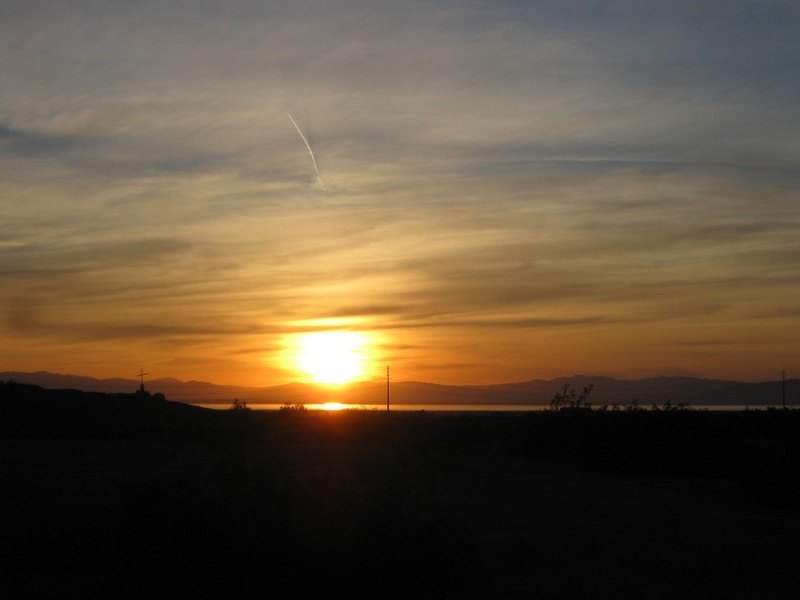 Niland, California is on the eastern side of the Salton Sea, about an hour and a half away from Palm Springs. 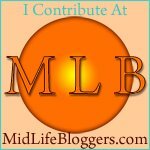 So after a great time along the eastern Salton Sea (previous post) I headed over to Niland to catch a glimpse of Salvation Mountain before sunset. I was disappointed that I missed, Leonard Knight , who created the mountain. I hear that he loves to tell folks about his creation. I still enjoyed ‘experiencing’ his work and it certainly is an experience. The main mountain is three stories high, the side area is like walking through a painted forest, there are alcoves, vehicles, old farm equipment and more. 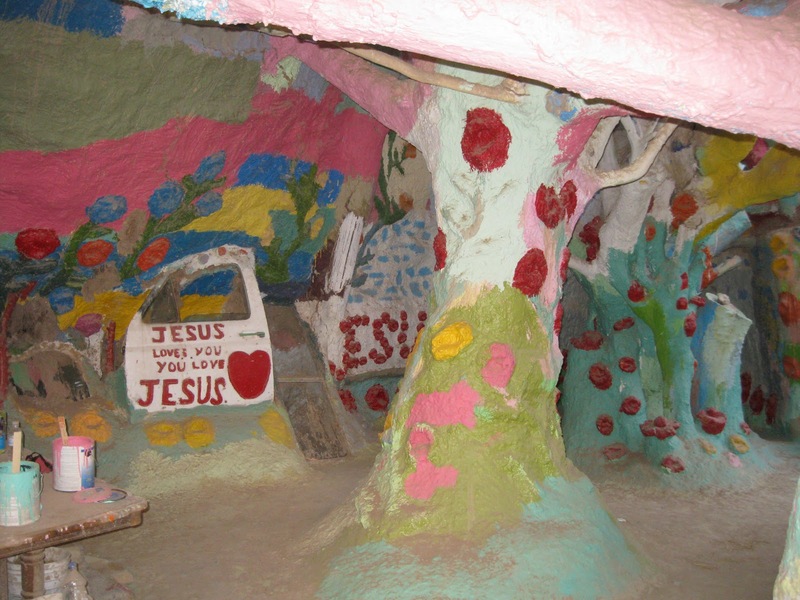 Everything on the property is covered in paint and offers a scripture or “God is Love” message. To say Leonard is a man with a message is an understatement. 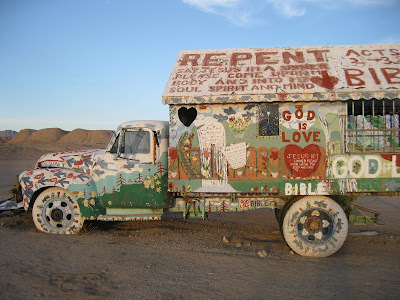 EVERYTHING .. vehicle tires, trailers, mailboxes, tractors, mirrors, everything, is painted with a Biblical message! He continues to expand and change the area and has dozens of new cans of paint waiting to be used. Many empty cans have just been left in place. 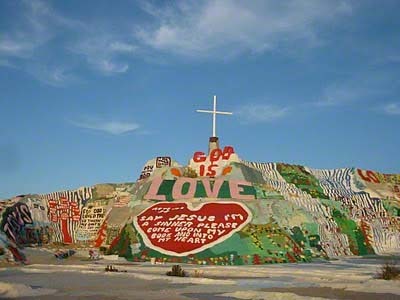 The mountain is made of hay bales, adobe & paint, some of the other areas also use tree limbs, block glass and poles. There are two plaques onsite one showing that the site was designated a National Folk Art site in 2002 and another showing recognition as a National Treasure by a Congress woman. Interactive art.. religious expression, a national treasure? I don’t know. Whatever you want to call it, I sure enjoyed wondering through this creation. 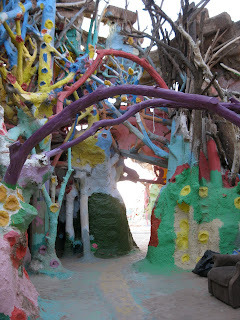 Slab city is right next to Salvation Mountain. Slab city was an old military training ground. Now it serves as a very unique winter home for many boondock loving RVers. Several folks do call it home year round as well. It is all desert and has no running water or electric, some of the sandy roads have makeshift signs, some don’t. There is no charge to stay there. I only had enough time to make a quick drive through before the sun sunk into the Salton Sea but I found this video gives the flavor of what you will find there. You can find Salvation Mountain and Slab city by going about 5 miles or so, east of Highway 111 on Main street in Niland, CA.